Cotton is soft and fluffy staple fiber that grows in a boll around the seeds of cotton plants. Number of textile products are made from cotton. It is made of pure cellulose and is soft and fluffy fiber. Mainly it is used because of its stupple and lightweight, comfortable and airy material. Cotton sarees are worn as daily wear, office wear as well as during festive seasons in all over India. 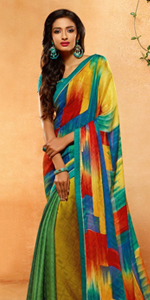 Indian cotton saree gives relax feeling and comfort to housewives and even working women. LadyBaazar is here to make your cotton sarees online buying easy at few clicks and you can see different varieties and colors and fabrics in them. At our online store you can shop by fabrics like net, silk, brocade, satin, georgette. Shop by colors like red, blue, green, cream, yellow etc and also by occasion like wedding, casual and reception. LadyBaazar is known for its best quality products and on time delivery. We provide worldwide delivery at affordable shipping cost. Also we offers free shipping orders above $400.